style="text-align:center;"> Please note that this topic has not had any new posts for the last 3744 days. I sent a cca request to mint for a copy of my agreement with them,i received the following from them and i wonder if what they sent is a true copy,is this just a application form copy,the box where they sign and date seems to have been cut and pasted on to the form and i can't read what,s dates there or who signed, also the credit amount thats there is wrong it was only around the £2,500 when first taken out. Seperate sheet they sent link below. They sent you an application form. Also the terms and conditions on page two refer to charges of £12. Which were changed recently. 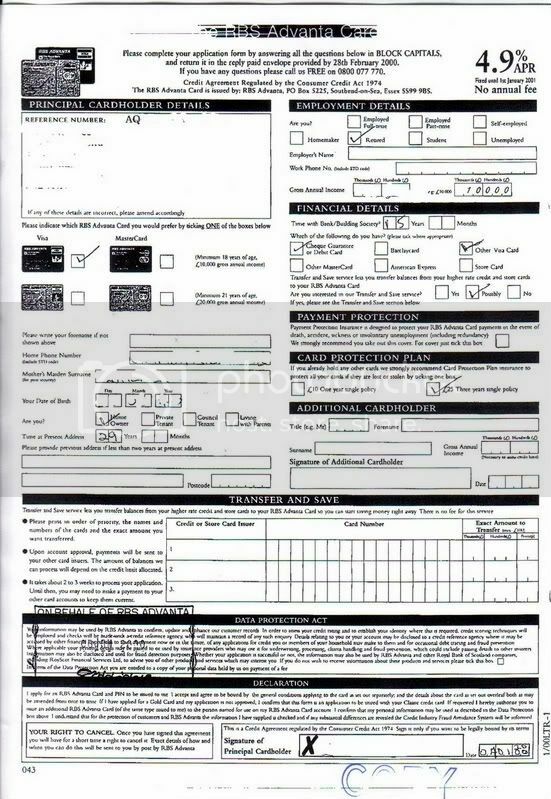 But the application form is dated 2000. The terms and conditions/key information should be the ones that would have been from 2000 and the ones that would have been with the agreement at the time. They've just cobbled together a few bits to make it look like they have an enforceble agreement. All the pescribed terms should be on the signature document. Nowhere does it refer to the second page. So I would say it's unenforcable. Thanks for your replies fuzzy + credit,i will send a letter and ask them for the proper documents. Quick update on this,i sent a letter pointing out that they seem to have sent me a application form and not what i had requested,waiting to hear back from them.I then got a letter from a dca telling me that they had been instructed to collect the alleged debt from by Rbs mint on the 14th July 2008 that was the same day the letter is dated that they sent with the info shown in photos.I sent the dca a email on Monday pointing out that the account was in dispute with Rsa Mint,they replied informing me that Rbs Mint have never informed them at anytime that the account was in dispute and have returned the account to Rbs Mint.It seems strange to me that they sent it to the dca before i received the info requested,waiting now for further developments. Who was the DCA sent you the letter? Thanks for your reply credit,it does say prescribed terms overleaf,i still don't understand which of the 2 pages sent this refers to,i about to send a letter to them asking for clarification on 3 points on the application form sent.I thought i had read somewhere that any credit agreement before 2005 must contain the t & c within the document and not on a seperate page.Will let you know when i hear back from them. Morning,quick update received another letter yesterday and they still are adamant that they have supplied the correct documents and this is our final response. Thanks for your reply credit,it does say prescribed terms overleaf,i still don't understand which of the 2 pages sent this refers to, I agree. Very hard to see, but it looks as if there is a statement which says "I accept and agree to be bound by the general conditions applying to the card as set out separately, and the details of the card as set out overleaf...." So where is the copy of the details overleaf? Even if they can supply the separate general conditions applicable at the time you took the card, IMHO that would not make the agreement enforceable in court, as they would actually have to be able to show what was being referred to overleaf. So it seems they would have to provide the original 2-sided document to prove their claim in court. Although they may not yet have provided you with a copy of the other side of the application, it does not mean they don't have it, or the original, so I guess you need to pressurize them into supplying a copy of the other side. i about to send a letter to them asking for clarification on 3 points on the application form sent.I thought i had read somewhere that any credit agreement before 2005 must contain the t & c within the document and not on a seperate page.Will let you know when i hear back from them. Hi Rob,thanks for your reply. I think it as been copied and pasted as well and i can't make out who as signed it or the date it looks like 2000 but the date i can't make out. This is the text from the declaration box. differences are revealed the Credit Industry Fraud Avoidance System will be informed. I was just re-emphasising what had already been said in the thread regarding the details of the card as set out overleaf as without seeing them you obviously do not know what they are (and neither would the Judge ). Unless RBS can show what those terms were, they cannot prove anything, so you need to insist on receiving the 'other side' of the application form. Just a quick update,they have now passed this on to Allied International Credit (UK) for collection,would it be a good idea to sent these muppets a in dispute letter and a cca request.I am going to get in touch with Mint again stressing i have still not received what i requested. Keep up the dispute unless they provide something that's properly enforceable. They'll try any tricks to con you into paying something. If you feel brave enough, invite them to take you to court and prove it there. Most of them will decline that offer. Some of them have realised that taking on a CAG member is getting a bit too expensive.